More on the 2015 General election in due course. But before I start whingeing about the boring stuff, it’s time to dwell on one of the rare points of complete satisfaction thrown up by the election. Every election features a watershed moment where the result at a single particular constituency captures the zeitgeist, somehow encapsulating the broader experience of the election at the essential level on a single stage as the results are announced to the jubilation of the winner and the consternation of the loser. In 1997 it was the defeat of Michael Portillo. After nearly two decades of Conservative government stumbled into exhausted and apathetic defeat against Blair’s resurgent New Labour, the defeat of Portillo – once the Great White Hope of Thatcherism – seemed to characterise the decisive point at which the old order expired and the new departure began. I can still remember the atmosphere at work the next day, passing colleagues in the corridor announcing the single word ‘Portillo’ to one another through broad grins. What moment could possibly match or surpass that in the otherwise depressingly downbeat 2015 election? The defeat of ‘Gorgeous’ George Galloway, of course. Galloway’s ambitions as a supposed pro-Palestinian and anti-war poseur, sorry, ‘figure’, led to his explusion from the Labour party and his subsequent career as a carpet-bagging MP. Using a platform provided by the Stop the War Coalition and the Respect political party (featuring some entirely predictable splitting by the Trotskyite Socialist Workers Party and the even more predictable degeneration of Respect into a vehicle for Galloway’s ego on the way), Galloway exploited an ‘anti-war’ agenda and divisive Asian ethnic identity politics at Labour’s expense in order to get elected in London and then Bradford. The essential problem has been that Galloway’s pretensions are hypocritical. Despite claiming to be anti-war, Galloway has no problem with advocating violent ‘resistance’ against British troops in Iraq – resistance perpetrated by unelected terrorists who killed the majority of Iraqi civilians in the post-invasion violence. Despite expressing his opinion of the understandable nature of a hypothetical assassination attempt on Tony Blair due to Blair’s Galloway’s characterisation of him as a mass-murderer of civilians in Iraq, Galloway’s opposition to such mass-murdering tyrannts as Blair is more selective than he likes to admit. Let’s face it, it can be hard to tell a middle-eastern autocrat to his face that he’s a tyrannical mass-murderer of Iraqi civilians. Galloway’s courageous attempt at doing so when he met Saddam Hussein in 1994 included the memorable phrase that he ‘saluted’ Saddam’s ‘indefagitability’. So let’s have another reminder of Galloway’s principled stand against tyranny on that occasion. 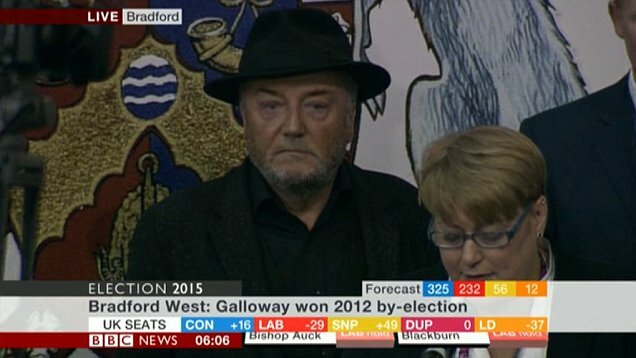 Sadly, this won’t be the last we see of Galloway, as he will continue to indulge the Blair-rage and ‘anti-war’ posturing of those elements of the British electorate who are quite happy with despotism, war and the deaths of civilians, provided they are achieved by the correct anti-American figure of choice. He will turn up to exploit this particular agenda again but now the slow passage of time will condemn him to irrelevance, as he will slowly metamorphose, even in the eyes of his acolytes, from a principled political dissenter to the fringe lunatic standing next to the Monster Raving Looney Party’s candidate at the hustings. That process began with his defeat in Bradford West.